How Much Weight Do You Lose When Walking Two Miles? Erin Monahan is an author and editor with over 25 years experience. She has written on a variety of topics including celebrity interviews, health reporting and parenting. Her work has appeared in daily newspapers and national magazines, including "Wondertime," and on websites such as Kaboose.com. She was recently named one of the top writers in Pennsylvania. She holds a Bachelor of Arts from Simmons College. 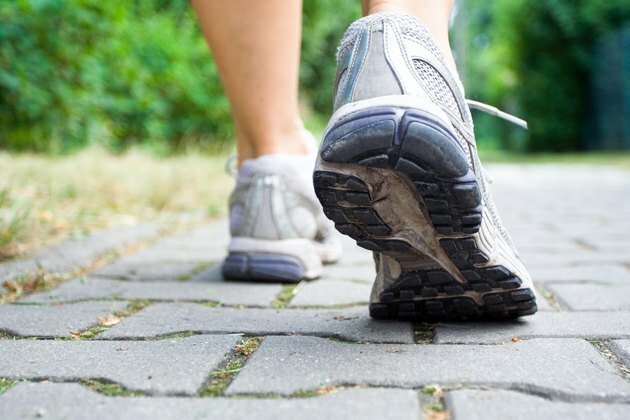 Walking is often touted as one of the best and simplest ways to lose weight. Nearly everyone can do it, and there are many different ways to perform this exercise. Walking will help you lose weight, but the amount of weight you lose depends on the length of your walk and your current weight. The American College of Sports Medicine suggests a way to track your walking is to use a pedometer because it will record how far you've walked and how many steps you've taken. For each pound you want to lose you'll have to burn 3,500 more calories than you consume. If you want to lose 2 lbs. per week, you'll have to have a deficit of 7,000 calories over those 14 days. Many people achieve this deficit by consuming fewer calories as well as adding exercise to their day. However it's possible to lose weight by simply adding exercise such as walking. The number of calories burned depends on how much weight you're carrying. For instance, if you walk a leisurely 2 mph and you weigh 160 lbs. you'll burn off 182 calories, according to the "Compendium of Physical Activities: An update of activity codes and MET intensities." If you weigh 200 lbs., that same walk will burn 228 calories. Walking more quickly will not burn more calories, although it will shorten the time of your workout. For instance walking 4 mph will burn the same 182 calories over two miles, but you will only need 30 minutes to complete your workout. If you weigh 160 lbs. and you're walking two miles per day and burning 182 calories each time, it will take about 19 days to lose 1 lb. While that might seem small, in a year it adds up to more than 19 lbs. as long as your calorie consumption remains the same as it was prior to beginning the exercise. If you weigh 200 lbs. and walk two miles per day you will burn 228 calories each session you will lose a pound every 15 days, or about 24 lbs. per year. You can bulk up that weight loss a little by carrying weights on your walk, but the best way to add to the weight loss is to add time or distance to your walk. Always check with your health care provider before beginning any weight loss or exercise program to make sure you are fit enough for success. In addition, stop walking if you become short of breath or experience chest pains. Start your walking program slowly and build up in both distance and speed to avoid injury. Will I Lose Weight by Walking 1.5 Miles a Day? Will Walking Eight Miles a Day Help Me Lose Weight? How Long Will it Take Me to Lose 50 Pounds by Walking Everyday? How Many Miles Do I Need to Walk a Day to Lose 75 Pounds?